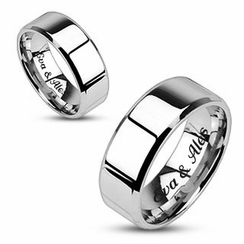 Personalized Couples Ring with your message. An engraved ring is a great gift for anniversary or any occasion. These stainless steel rings and bands will not turn or change color. Face and Band Width: Female 0.16" Male 0.24"
Our custom engraved stainless steel rings are crafted with High Polish 316L Surgical Stainless Steel; the highest grade of stainless steel used in the jewelry market. It is fantastic at resisting fade, blemishes and rust. It is 100% resistant to corrosion. It will not fade, change color or leave stains on your body. It doesn�t require any maintenance to keep it looking new. The stainless steel we use for our high quality rings is the most worry-free and maintenance-free material for jewelry.